V.com weekend vote: What size is the smallest violin you've played? It's not easy to get a great tone on these babies -- or for a grown-up to play in tune, but it's wonderful that little kids can learn on an appropriately-sized violin. What is the smallest fiddle you've ever played? And you can't count tuning a student's 1/32. By "played" I mean performed in a concert, created a video or had long-term as your main fiddle. To be honest, for me it was probably a 1/2-size, when I was a youngster. One of my teachers, as a joke, performed a Mozart Concerto on a half-sized violin -- and did it perfectly in tune! How about you? I have a 1/32 fiddle but thought it was just to look at. Is yours meant to be played? Did you have to do something to it to make it playable? I have to admit, I bought it before I started playing violin so hadn't really thought about it. 1/2. Surprised how many started on 4/4 -- 28% at this writing. Sorry--I misunderstood the picture. The one Laurie was "playing" was not 1/32, although it is the size of the tiny one I have. 1/2 size when I was 9. I'm amazed full-grown adults can play on such tiny fiddles; I can't play in tune on a full-size, let alone 1/32! I started at age 10 on a 4/4 size. I'll demonstrate on student violins, but 1/2 size is the smallest I can play in tune. The left hand isn't as bothersome as the right; my right elbow yearns for freedom. 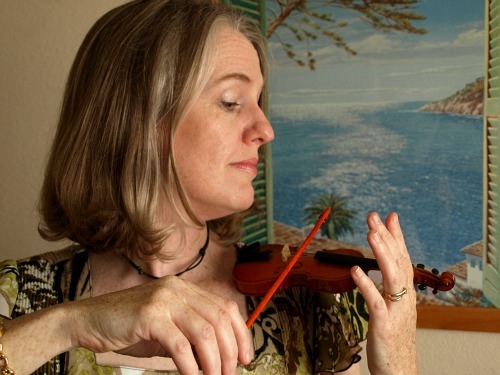 Also, Laurie, it looks like you need a shoulder rest for that tiny fiddle. I started at 7 on 3/4 size. I'm surprised at how many voters started on sizes less than 3/4 - 58% at this writing. I'm trying to imagine a shoulder rest that would bridge that gap! I started on 1/10 size when I was 5 years old. Link at top for 32nd violin is not working! Where can I find it?